As new rulers (and their voters) gradually realize that austerity cannot be simply voted out of existence, or prosperity into existence, the prevailing mood is that of a bad hangover. 'We stay in Europe' rally in Athens, June, 2015. Demotix/ Chrissa Giannakoudi. All rights reserved.Having spent the best part of the last six years talking and writing about the Greek crisis, I often find myself wondering what else one might add to that subject. Then I realise that so many misconceptions still abound, even about basic facts, that to keep writing and talking (preferably with each other, rather than in parallel monologues), is our best bet for coming to terms with the crisis and its aftermath. After all, no successful resolution of any crisis is ever possible without a shared understanding of what went wrong and why – and without a common effort to ensure that next time we will know better. Clearly, nowhere is this task more urgent than in Greece herself. On the one hand, because the country was far more affected by the European crisis than any other: in 2008-2014 the size of her economy shrank by an almost unprecedented 26%, compared to 8% in Italy and Portugal, and 6% in Spain. On the other hand, because since most Greeks like to think of ourselves as direct heirs of Socrates, they ought to feel especially bound by his imperative to “know ourselves”. Yet, looking at the current level of public debate in the country, a casual observer might be forgiven for thinking of Greeks what Talleyrand allegedly thought of the Bourbons: “They learned nothing, and forgot nothing”. In fact, Greeks have not forgotten the misery and humiliation of the last five years – and how could they? But neither do they appear to have collectively grasped that no country can live in perpetuity with a twin (i.e. government budget as well as current account) deficit at 15% of GDP apiece, without something unpleasant happening next. Which explains why, as shown in the January and September general elections and the July referendum (all in the space of this year), the battle over the causes and implications of the Greek crisis has been decisively won by those who have managed to present it as a vast international conspiracy against a proud and blameless nation. No wonder that, as the country’s new rulers (and their voters) gradually come to realize that austerity cannot be simply voted out of existence, just like prosperity cannot be voted into existence, the prevailing mood is that of a bad hangover, disbelief and resignation. Of course, the retreat into comforting myths in the face of inconvenient truths is hardly confined to Greece. The spectacle of crowds occupying Constitution Square to shout “Not our debt”, their gross immaturity given pseudo-intellectual patina by university professors who should have known better (and who were later rewarded for their efforts with cabinet posts), struck me as frankly embarrassing. But shouldn’t this also be said of politicians in northern member states shrugging off the Eurozone crisis as if it were a simple story of lazy and corrupt southerners living beyond their means? As if it were possible to have, in Kenneth Dyson’s words, “feckless debtors” without “reckless creditors”. Be that as it may: faced with the dilemma of whether to acknowledge and explain to their voters that the European rescue of Greece was also, if not primarily, the rescue of over-exposed French and German banks by European taxpayers, politicians in creditor countries who should have known better consciously chose to keep quiet about that. They would take instead the path of least resistance, reverting to the same tired (but so effective) clichés. Does any of this matter? I think it does. Words matter: when they are uttered by influential politicians and opinion makers, they shape public perceptions; and when these perceptions become entrenched, they act as powerful constraints on politicians’ room for manoeuvre. The ordoliberal toolkit has brought benefits to certain national economies – this much is true. But it has at the same time undermined European recovery. Looking back in order to look ahead: recognising past failures is painful, but also essential – if, that is, the deeper causes of the current crisis are to be addressed, systemic imbalances tackled, and if the costs of adjustment are to be more broadly and fairly allocated in the event of another crisis – perhaps inevitable, but hopefully less devastating. My fellow economists, as we all know, have not been of great help either in predicting the Great Recession, or in preventing the Eurozone crisis – to put it very mildly. With the benefit of hindsight, many in the profession now accept that mainstream economics underestimated the destructive tendencies of unregulated finance. Closer to home, much damage has been done by ordoliberalism in Germany and elsewhere, with its narrow focus on fiscal deficits, its unshakeable faith on the magical properties of austerity, and its fixation on ‘beggar-thy-neighbour’ competitiveness. The ordoliberal toolkit has brought benefits to certain national economies – this much is true. But it has at the same time undermined European recovery. Yet, the response to ordoliberalism has often been equally misguided. Take for instance the celebrated cases of Nobel laureates Joseph Stiglitz and Paul Krugman urging last summer the Greek government to exit the Euro and default. As even Mr Tsipras eventually came to realize, their advice, if heeded, would have had disastrous consequences. Reflating the economy via counter-cyclical demand management (i.e. an expansionary fiscal and incomes policy) might be a good way to engineer recovery in Europe. But as a recipe for Greece, following Grexit, it would merely set in motion the deadly spiral of economic decline: i.e. devaluation leading to inflation leading to erosion of real wages leading to lower living standards for all. The kind of thing we thought we had left behind for good when joining the Euro. And this is the best scenario; the worst being the effective end of Greece’s ambition to be a European country for the foreseeable future, with all the implications this would have for Greek democracy in a context of economic decline and geopolitical anxiety. The fact that, after five long and miserable years of extreme austerity, closely associated in people’s minds with EU policies, support for the Euro within Greece remains at around 70%, is a strong hint that ordinary Greeks intuitively understand the costs of Grexit better than most. By the way, the sudden popularity of Keynesianism in Greece has always looked suspect to me. Yes: counter-cyclical demand management, an essential ingredient of the Keynesian economic doctrine, requiring an expansionary fiscal stance (higher spending and/or lower taxes), is often the appropriate response to a temporary downturn. But, by the same token, a restrictive fiscal stance (higher taxes and/or lower spending) is what counter-cyclical policy would imply during a boom. Not a trace of that in Greece, pre-crisis: amidst the euphoria of credit-driven prosperity, latter-day Keynesians were conspicuous by their absence. At any rate, recent contributions by economists have changed the intellectual climate, and may even prove instrumental in bringing about a shift in policy as well, which is why they deserve the attention of a broader audience. Some have come out over the last few days. On 17 November, a team of IMF economists explained why internal devaluation, i.e. “a boost to competitiveness not through an (external) devaluation of the currency but by internal means, such as wage cuts or wage moderation […] can only work well if supported by accommodative monetary policies. In the absence of such policies, wage moderation does not deliver much of a boost to output in the countries that are undertaking it, and also ends up lowering output in the Euro area as a whole”. Given that it was the IMF itself that, as part of the Troika, had urged internal devaluation upon Greece (via measures such as the 22% cut in the nominal rate of minimum wages in February 2012), the statement had the flavour of an explicit departure from, if not disavowal of, an earlier position. On 20 November, “a dozen leading economists from across the spectrum” published a consensus narrative report, explaining that the main imbalances in the Eurozone were not fiscal but macroeconomic: as a matter of fact, all five GIIPS ran (sometimes large) current account deficits pre-crisis, while budget deficits were an issue only in Greece (and, to a far lesser extent, Portugal). The fact that, after five long and miserable years, support for the Euro within Greece remains at around 70%, is a strong hint that ordinary Greeks intuitively understand the costs of Grexit better than most. On 22 November, two Greek economists teaching at Yale and London respectively, wrote a piece shifting attention to export under-performance as a neglected cause of the duration and depth of the recession in Greece (exports actually declined over much of the period). They also suggested that the focus of structural reforms was, at the very least, one-sided: while “labour markets have adjusted to the new economic environment, product markets have not adjusted, hindering the recovery of competitiveness”. Rather than the kind of ‘negative conditionality’ pursued over the last few years, the authors recommend the EU pursue ‘reforms under positive conditionality’ A good example of that would be the introduction of a European Unemployment Insurance Programme. True, social insurance is best introduced when times are good, when the ‘veil of ignorance’ of who might in future benefit from its provisions encourages all to contribute. Too late for that now: with the veil of ignorance partially removed as a result of the Eurozone crisis, an EU-funded European Unemployment Insurance programme looks suspiciously like a Trojan horse for permanent fiscal transfers to Greece or Spain. But this need not be so: having a fiscal stabilizer in place when a region or a sector of the European economy is hit by an asymmetric shock is a sound idea, irrespective of who benefits. And – who knows? When China starts importing fewer goods manufactured in Germany, it could be workers in the Ruhrgebiet who suddenly become beneficiaries from such a programme. According to Bofinger, the zero growth of real wages in Germany (with unit labour costs in manufacturing declining by 9% in 1999-2008) exacerbated the macroeconomic imbalances of the Eurozone in a variety of ways: (i) it caused stagnation in German domestic demand, which had a negative impact on the German demand for goods and services from the rest of EZ; (ii) it improved the price competitiveness of Germany gradually which led to a deterioration of the bilateral current account of the rest of the EZ; (iii) it complicated ECB efforts pre-crisis to bring inflation across the Eurozone closer to the 2% target; and (iv) it caused higher profits in the corporate sector, which led to a higher saving rate of this sector (the household saving rate in Germany has been more or less constant since 1999. Where does all that leave us? In my view, to a more nuanced view of what went wrong in the run-up to, and the handling of, the Eurozone crisis; to a better understanding of the complex interactions at work; and to a glimpse of what needs to be done. Make no mistake. What is at stake is not the creation of a transfer union to compensate member states like Greece, deemed to be inherently incapable of being ‘competitive’: such a union would not only be unrealistic in view of political realities in core countries, but also utterly humiliating in recipient countries themselves. What is at stake is our capacity to build a European economy that is dynamic as well as sustainable, whose success rests on complementarities between national economies not mutually destructive competitiveness. Viewed from this angle, the assertion that ‘Greece will never be competitive’, quite popular in Germany and elsewhere, calls for a response other than Grexit, or the dismantling of the Eurozone tout court. Granted, Greek firms are rather unlikely to duplicate, let alone outperform, the successes of the German (or, for that matter, French or Italian) motor car industry. The crucial question is what Greece’s comparative advantages might be, how the country’s productive capacities can be upgraded (as these ultimately determine any nation’s living standards), and what Europe can do to help. The answer to that goes far beyond the usual call to ‘relax austerity’: it includes policies to improve institutions, modernize public administration, reform welfare, and invest in education – with the aim of helping Greece to stop being a drag on Europe’s common resources, and to win its place as a small but integral component of a dynamic and sustainable European economy. Helping Greece and other peripheral member states to upgrade their productive capacities is not part of the EU agenda, but would be perfectly in line with the structural changes many in Europe have for a long time identified as absolutely crucial for the completion of monetary union: closer co-ordination of economic policies across the Eurozone (putting, as it were, the ‘E’ back into ‘EMU’); a larger EU budget to allow for fiscal stabilization in the event of asymmetric shocks; a Fed-style mandate for the ECB (adding employment growth to price stability as its key objectives). Less than a full fiscal union, let alone a federal state, to be sure – but a significant improvement on current arrangements all the same. No prizes, then, for guessing where I stand relative to recent calls, by Wolfgang Streeck among others, to dismantle the monetary union. Even though he argues his case with the elegance and erudition for which he is rightly renowned, I am not terribly persuaded by his conclusion – nor am I much reassured by his belief that Europe is more than the common currency, and hence is bound to survive its demise. Even if, for the sake of argument, we accepted that creating the Euro was a mistake, there is such a thing as momentum: should the Eurozone unravel, Europe would not return to 1999, but go back a lot more. Perhaps not all the way to 1939, but certainly back enough to reverse decades of progress towards ever closer union, which was our founding fathers’ way to put an end to the European civil war, 1914-1945. As for Greeks, having lived the first three quarters of last century either at war or under an authoritarian government (or both), they may be forgiven for showing little enthusiasm for the attractions of Grexit. In spite of Mr Schäuble’s and Mr Varoufakis’s valiant efforts, and notwithstanding five years of harsh austerity, an overwhelming majority of Greeks continue to support the Euro. This hardly makes sense at all, except as a reflection of their longing to share in the European dream of peace, stability and prosperity for all. It is high time others in Europe and beyond acknowledged this, and stopped wondering why their advice for Greece to commit suicide is not so gratefully received by those actually living in the country. 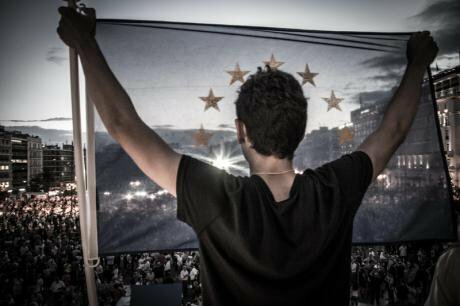 An earlier version of this article was presented at the conference “The Greek crisis and its impact on the future of the EU” (Collegio Carlo Alberto, Università degli studi di Torino, 3 December 2015). Kenneth Dyson (2014) “States, debt, and power: ‘saints’ and ‘sinners’ in European history and integration”. Oxford University Press. Philippe van Parijs (2015) “Epilogue: justifying Europe” in “After the storm: how to save democracy in Europe” (edited by Luuk van Middelaar & Philippe van Parijs) Tielt: Lannoo. Joseph Stiglitz “How I would vote in the Greek referendum” (The Guardian, Monday 29 June 2015); Paul Krugman “Greece over the brink” (The New York Times, Monday 29 June 2015). Interestingly, according to the results of Standard Eurobarometer (Spring 2015), support for the Euro was higher in those member states most affected by the Eurozone crisis (Greece 69%, Italy 59%, Portugal 62%, Spain 61%, Ireland 79%) than in the EU as a whole (57%). Jörg Decressin et al. (2015) “Wage moderation in crises: policy considerations and applications to the Eurozone” (IMF Staff Discussion Note 15/22). For a similar retraction of another pillar of IMF advice to countries hit by the Eurozone crisis, see Olivier Blanchard & Daniel Leigh (2013) “Growth forecast errors and fiscal multipliers” IMF Working Paper 13/1). Richard Baldwin et al. (2015) “Rebooting the Eurozone: step I – agreeing a crisis narrative” (CEPR Policy Insight no. 85). The report was signed by, among others, Olivier Blanchard (chief economist at IMF until October 2015), Daniel Gros (Director of the Centre for European Policy Studies), and Christopher Pissarides (Nobel Laureate, LSE Professor). Costas Arkolakis & Manolis Galenianos (2015) “The challenge of trade adjustment in Greece” (VoxEU). Tito Boeri & Juan Francisco Jimeno (2015) “The unbearable divergence of unemployment in Europe” (CEP Discussion Paper No. 1384). Peter Bofinger (2015) “German wage moderation and the EZ Crisis” (VoxEU). Wolfgang Streeck (2015) “Why the Euro divides Europe” (New Left Review 95).